One of the biggest issues in education is summer learning loss. Each year, students in the U.S. make incredible academic gains during the school year only to lose a large percentage of those gains when they turn off their brains over the summer. “The so-called ‘summer slide,’ which occurs when kids fall behind in reading and math over the summer, is well-documented, cumulative and most damaging to children from low-income families. About two-thirds of the 9th grade achievement gap in reading has been attributed to summer learning loss,” states Nina Rees for U.S. News. In Mineola Union Free School District in Long Island, this trend of summer learning loss has been prevalent for years. Although the high-performing Apple Distinguished District has many nationally-recognized initiatives in place to help keep students engaged, creative, and academically stimulated during the school year, growth paused in the fall when students had to be retaught concepts they'd mastered the previous year. Despite gaining an average of 7-12 percentile points during the school year, Mineola students’ median fall percentile had remained relatively constant, rising only two points in two years. Efforts to close the achievement gap during the school year alone were proving unsuccessful. Even in high-performing districts, summer slide causes lost percentile gains. Forced to backtrack at the start of each school year, Mineola educators sought new ways to close the achievement gap and push the boundaries of student learning. In 2015, the New York district piloted a summer program with 150 students. Taking advantage of the district’s existing iPad technology, the pilot program allowed students to take their devices home over the summer for the first time. "The summer slide has been a challenge for educators since time immemorial. 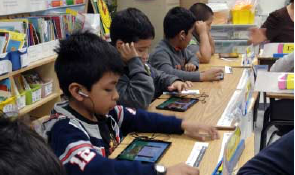 Mineola realized we had a great opportunity to leverage our 1:1 iPad initiative by allowing our students to retain the iPads over the summer," stated district Superintendent Dr. Michael Nagler. As an extension of Mineola's four year eSpark implementation, a mix of first through fifth grade students were instructed to use eSpark for an hour each week for reading. In between summer camps and sporting events, kids engaged with differentiated instruction tailored to their unique literacy needs. Interactive apps and videos captivated students to learn and practice skills while creative challenges allowed them to apply their new knowledge. "The summer slide has been a challenge for educators since time immemorial. Mineola realized we had a great opportunity to leverage our 1:1 iPad initiative by allowing our students to retain the iPads over the summer." With extended access to the program, the rate at which students mastered new skills in eSpark remained constant from the school year through summer. By using 1:1 take-home iPads to build upon lessons taught in the classroom, the summer program helped students to retain and practice key skills and concepts when school was not in session. The typical “summer slide” was avoided and, while minor, additional percentile growth was achieved. 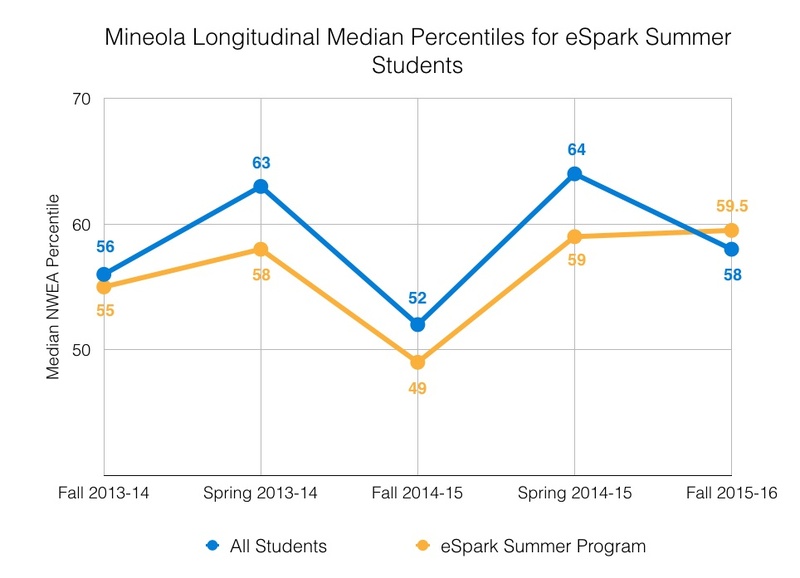 Summer eSpark students avoided learning loss and gained additional percentile growth. 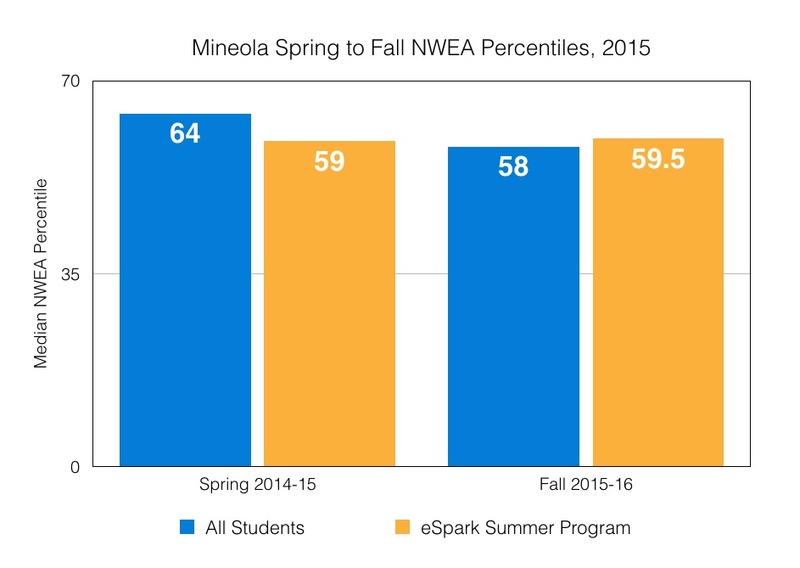 Mineola students who did not use eSpark over the summer dropped an average of 6 percentile points between Spring 2015 testing and Fall 2015 testing, experiencing typical learning loss. However, summer eSpark students saw no drop in median percentile performance and tested higher than their peers. In fact, students in the pilot program saw a median percentile increase of half a point. 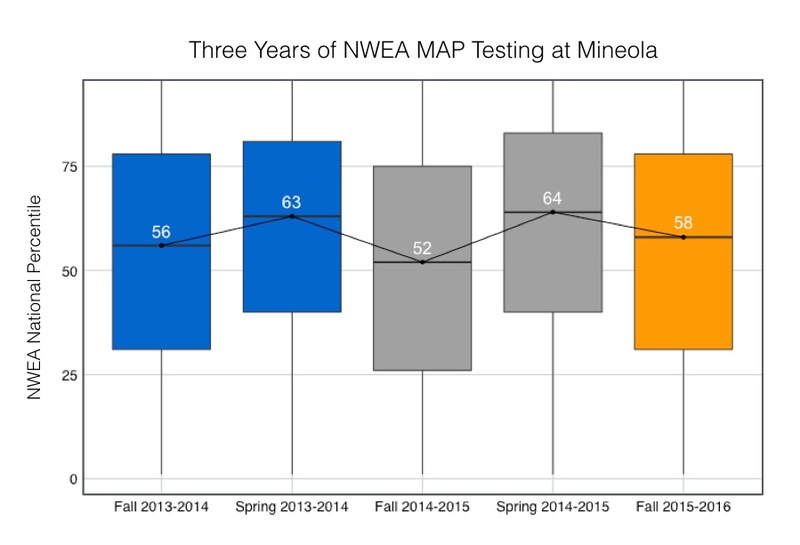 These results are significant compared against Mineola's average yearly percentile performance—but did these particular pilot students also have a history of sliding in the summer? In the Summer of 2014, the pilot students fell from the 58th to the 49th percentile—a drop of nine percentile points—proving their history of sliding just like their peers. Yet in the Summer of 2015, when using eSpark, the negative trend halted. "Since each eSpark quest is specific for each and every student, it was easy for learners to maintain skills and progress in his or her individual goals," explained Dr. Nagler. "We are ecstatic over the results, but not completely surprised. Focused, personalized programs like eSpark help each student achieve." The pilot students had a history of sliding in the summer before using eSpark. "We are ecstatic over the results, but not completely surprised. Focused, personalized programs like eSpark help each student achieve."